I’ve never been a big believer in The December Shopping Madness. Good cheer doesn’t come wrapped in plastic, so I’ve always preferred making gifts and sharing my time over getting the best deals on the newest stuff. Since I’ve journeyed even deeper into my anti-consumerist leanings, the rush to load a cart with shiny things seems like torture. When Eloise started rattling off her long list of wishes, like any 6 year old this time of year, I realized we need to prioritize the joy of giving. My daughter radiates compassion and kindness, but she still doesn’t grasp the tenuous relationship between happiness and stuff. We already have a tradition where we ask her to donate 5 old toys for every one on her list, and we celebrate the holidays with service and giving as much as with food and gifts. 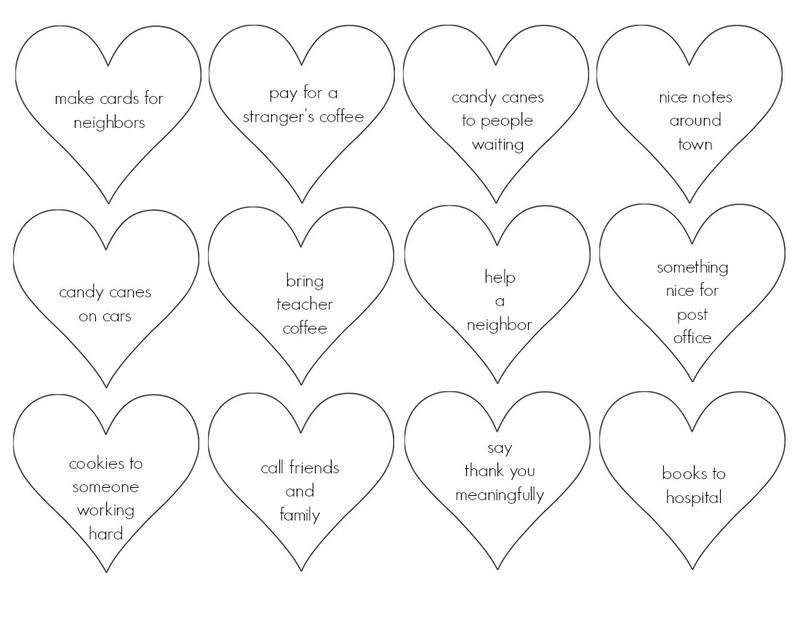 I decided to make giving and kindness the star of our festivities this year, starting with the Flock of Kindness Advent Calendar. These little birds perch over our fireplace so our home centers around kindness. Random acts of kindness calendars are not a new concept. 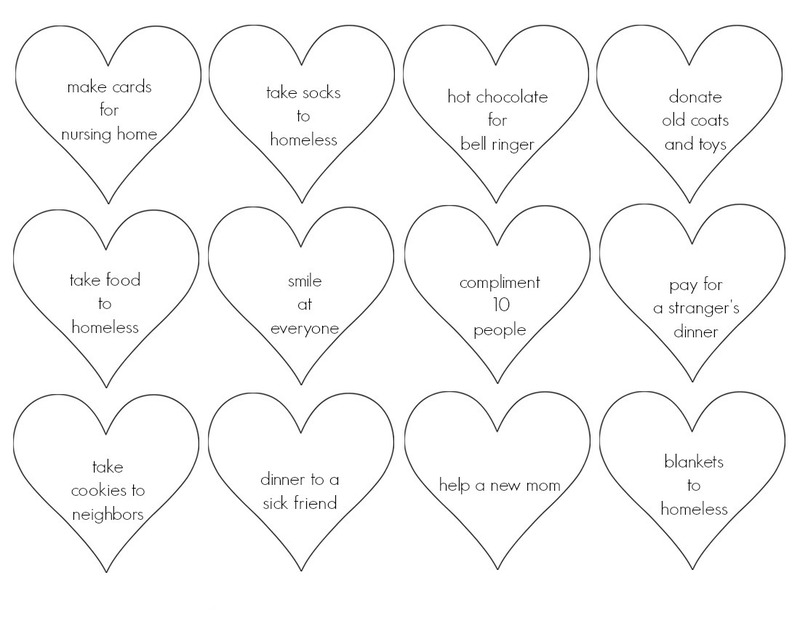 There are printable calendars all over the place, and lots of wonderful suggestions for things you can do to give back. Instead of just a small paper taped to the fridge, I made our calendar a focal point over our hearth. This way, our winter home centers around our commitment to caring and giving back instead of a pile of presents under the tree. A few nuts, a branch, an old sweater, and some scraps of paper are all I used for this easy project. Since I’m not buying new things, I rustled up materials around the house that could be easily composted, too. I adapted the almond bird ornament tutorials to the materials on hand. Most of these tutorials require lots of extra steps, like drilling tiny wire legs into the bottoms of the almonds, which is lovely if you want to make a keepsake ornament, but really tedious when making 24 birds. I think they are just as cute without labor-intensive little hats and legs! Simplicity is always more fun. This project took an afternoon, and I relished sitting in the cozy house on a gray day thinking about the memories we will make this holiday season as we set out to simply spread kindness and cheer. I love how the birds look perched with their little messages of kindness! Select 24 almonds that aren’t too chipped. Other nuts in shells would work, too. Fold the orange scraps of paper in half and cut 24 tiny triangles on the fold to make the beaks. They don’t have to be perfect, and you can always cut them smaller. Cut strips from the felted sweaters or felt to make the scarves. Make 1 and wrap it around the almond to see if you like the size and then use that for the pattern for the others. Mine are a variety of widths and lengths, and some came out a little uneven. I think this adds to the charm, making the scarves look like they were knit by hand. Enjoy working with the cozy materials, and don’t stress about holiday perfection. Dot the eyes on with the sharpie. Attach the beaks by dipping half of each beak in glue and pasting it to the almond. Don’t try to just paste the fold to the almond…secure the whole lower half to the nut. Lay the birds out along the branch to make sure you like the spacing. The first branch I picked was too short, so I had to reapply them all to a new branch. A little planning helps avoid a similar fate. Apply strong glue (I use E6000) to the base and back of the almond. Place the scarf at the back of the almond and secure the scarf and bird to the branch. Place a few almonds and then wrap the front of the scarf and secure with a dab of glue. If the bird is having a tough time sitting in their spot, it helps to secure the end of the scarf to the branch with a bit more glue for stability. While the birds dry, print the heart templates on red paper and cut them out and hole punch them. Number the hearts. I tried to loosely plan so that more time consuming activities fell on the weekends. Attach the birds with string to the branch, placing one next to each bird. I mixed the numbers up so that the calendar would look balanced throughout the season. It’s also fun to search for the number each day. We cut the hearts off each morning and discuss how we will meet our goal as we go to school. I’m also keeping the hearts from days past in a dish nearby so we can snuggle up and relive our warm memories of being kind all month long. December 1st we’re donating old toys. I’ll keep you posted on our other activities, too! I’d love to hear about your traditions of kindness, too! If you decide to make a similar calendar, I would love to see pictures.